Christmas is officially over! Some are glad and some are sad, but as we make our way into a new year, I wanted to fill you guys in on just how amazing it was for us this year! Here's the recap on all that happened on the 25 days of December leading up to Christmas! My talented friend Jeremy Richardson shot our pics; well - he shoots all of my stuff, so check him out! We started off by shooting our holiday pictures back in September during a scorching 92-degree afternoon (imagine the sweat I worked up in this velvet dress), and I designed our beautiful sweat-free card which we sent to all of our closest friends and family! We chose to shoot at the iconic and prestigious Wave Hill which is a 28-acre estate that consists of public horticultural gardens and a cultural center, all situated on the slopes overlooking the Hudson River and sits directly across the street from the home where former President John F. Kennedy and his family resided. I strongly encourage you guys to check out this page and see why this place is so special. Also to note, the very next day after we shot our holiday pics; no one other than OPRAH chose the same exact grounds, spots and location to shoot her October 2017 Oprah Magazine cover and feature article! As avid Knicks fans and true native New Yorker's, it was only right that we'd get @LittleMrGray to see his very first basketball game! Immediately after, we went and picked out our Christmas tree! We chose a gorgeous 10-foot balsam spruce tree (last year our tree was 8-feet! ), which I made sure needed to be adorned with Grayson's first train set particularly from the iconic FAO Schwarz! The hubs and I had a very fancy holiday date-night at the St. Regis because, you know...sometimes you just feel like putting on a ball skirt! Def recreating this picture when we're like 75! LOL! We received our very first snow day of the season and @LittleMrGray was much more into it this time than as opposed to last year when he had no clue what was going on, nor any visible desire to discover...maybe because he was only a few months old then, lol! We Decked The Halls...Ahem, Our Apartment! Once we had our tree and all of our trimmings, it was time to get festive and deck out our pad! Check out some of the highlights in the spread below! Most of these items came from Target, Marshalls, Etsy and Personalization Mall! So last year at Christmas, @LittleMrGray was barely 8-weeks old. It was freezing cold and he hadn't received any vaccinations just yet; so bringing him out anywhere or to see anyone, Santa included - was entirely out of the question. Between cold, flu, and RSV season - there was no way that I was going to risk bringing my baby out to see jolly Ol' Saint Nick. But, that's okay, because we nailed it this year! Well, almost. 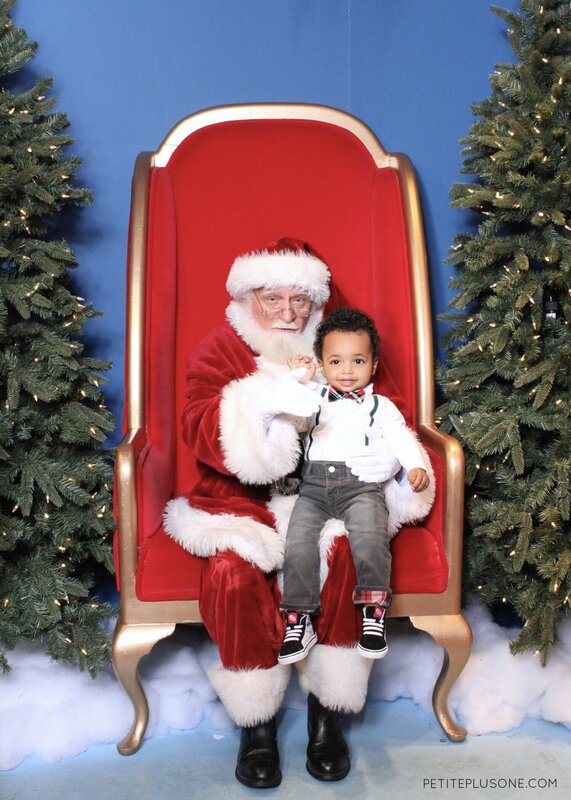 We brought him to Bloomingdales on 59th street (because I simply loathe Macy's and find their Santa setup rather tacky) and after a major freak-out session accompanied by tears after encountering the giant FAO Schwarz bear, our baby got it together in a snap and gave us the perfect Santa photo! coquito - otherwise known as Puerto Rico's take on "egg nog", it is a coconut and rum based drink made with cinnamon, nutmeg, evaporated and condensed milk. Each holiday season, we make the most amazing coquito to gift to friends. While the norm is that the mixture is often placed back into empty liquor bottles (Bacardi labels and all - see here); I decided to take it up a very fancy notch and bottle them in the prettiest way ever. Because, after all - who likes to be basic? Nope, not I! Thankfully, my equally fancy friend and home-decor enthusiast, Terressa at Increase The Fancy; designed these labels for us. She has one of the best DIY ideas and is so creative! Please check out her blog and follow her on Instagram for daily ideas! Once the tree was up, the gifts were delivered and the booze was ready; Christmas Eve arrived and it was time to make cookies for Santa! We made one batch of chocolate chip cookies and one batch of Ninjabread men because you know - when you're a mom to a boy, everything has to have an air of COOL instead of "cute". Cute isn't good enough for us lol! We got these unique and fun ninja shaped gingerbread cookies right on Amazon! They were so much fun to make and they tasted freaking amazing! Get them here! I never post on Snapchat. Like, ever. But, I do entertain the cute filters from to time and this holiday was no exception. I made Gray jump in some frames with me because what else are you going to do with them? Ha! Christmas Day in Star Wars PJ's! Gray woke up on Christmas Day to an insane amount of presents under the tree! I guess we can call our bank accounts Santa or whatever, but anywho - it was actually a delight to see as first-time parents. Although he really still didn't have a clue what was going on, there was much more involvement and interaction with him on Christmas Day this year at 13.5-months old than last year at 7.5 weeks! 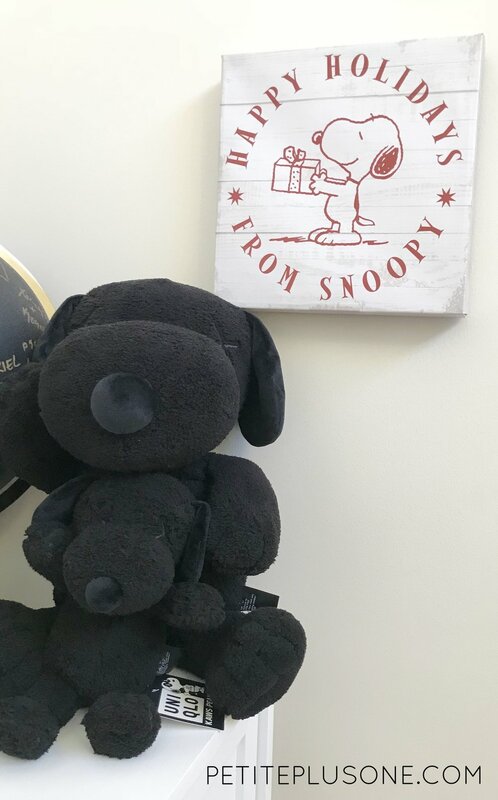 Between our own contributions and gifts shipped in from family and friends across the country, this baby got wayyyyy more gifts than what his attention span will allow for throughout the course of the year! We are super thankful though, and to make room for the new items we will be donating the majority of his older stash. As for our pajamas, the adult pajamas came from Target! I did have an exact matching set for Gray in the same order too but they went ahead and cancelled my item due to stock issues. Thankfully I found Gray's Stormtrooper pajamas on Amazon and was able to get them delivered the same day for free for being a Prime member! Not only did they save the day but they also matched us perfectly - without being too matchy-matchy! Either way - I absolutely loved the end result! The "holiday season" kicks off a bit earlier than for most. Some start it off in November, but we begin in October as we gear up to celebrate the birthday of our son. Like last year, this holiday season from start through Christmas has been amazing. Filled with family, friends, food, gifts, and so many well wishes. 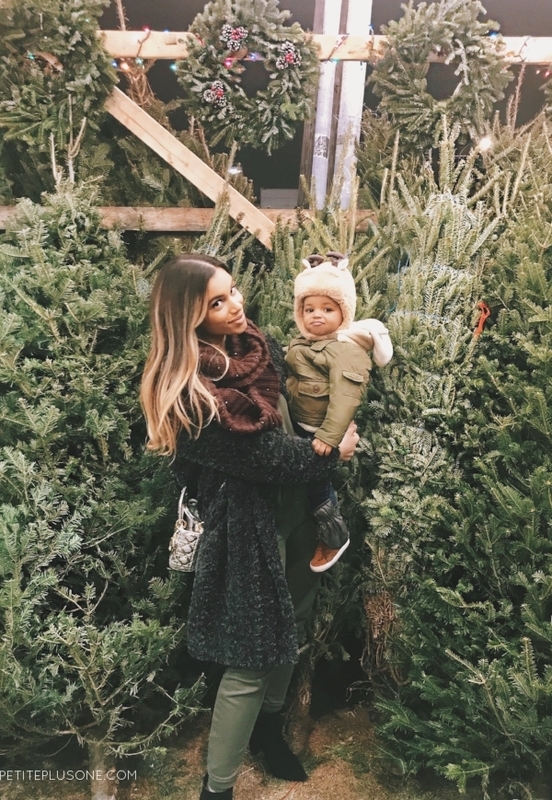 We're getting our traditions in place as a tiny little family; but along the way we are always stopping to take in and appreciate just how meaningful it's becoming for us. From sun up to sun down, the moments that come and ago we are both forever longing to relive and that is such a humbling blessing! The laughs from our son that echo through our home, and his little feet that we now here prancing on our floors make it all so worth it. What in my 20's admittedly used to be a holiday with a focus on tangible goods, and some serious sale-stalking strategies, with a sprinkle of family-time here and there; has completely transformed into something so much more meaningful. So, to all - Happy Holidays. It's our biggest wish that in addition to our loved ones, you and yours are having a memorable holiday season, and are able to enjoy the new year peacfully, happily, and in wonderfully good health!